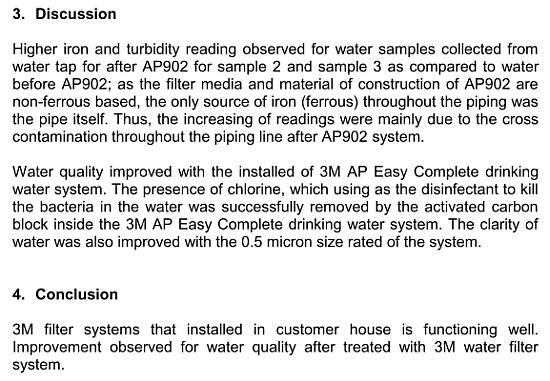 Over 3 months ago, I received an email pitch from 3M asking whether I would be interested to review their water filter system and the first thing that came to my mind was 'Huh? 3M? Water filter system?' 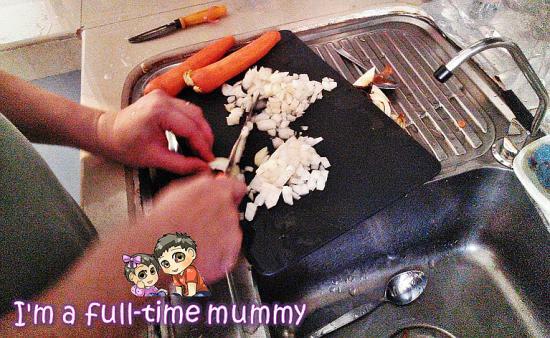 I had previously reviewed some products by 3M, such as their Scotch™ Premium Kitchen Scissors and Scotch™ Kids Scissors and never would have imagined they also have water filter systems in their product range. After exchanging emails to and fro between 3M representative, we decided to attend their product briefing at their Innovation Center to learn more about their products. 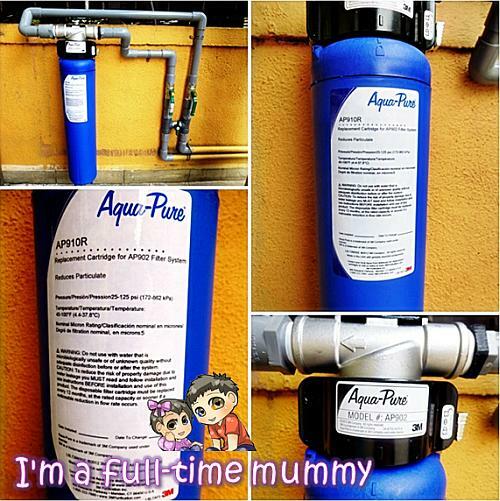 For your info, we have been using our current outdoor water filter system (to be referred in this post as 'brand B') for about 5-6 years and it has a backwash feature which hubby will occasionally turn on to backwash and clear off the filter. 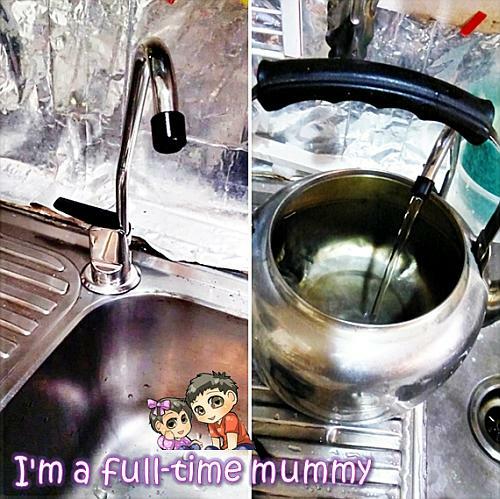 As for indoor, we did not install any water filter system at all. Now, before I start off with our review, I just want to share that a lot of procedures have been done in order to ensure our product review and testing is done correctly and we have results to show for it. Prior to the installation of the 3M Water Filter Systems, one of the 3M lab staff came over to our house to collect and test our current water sample. Anyway, back to the collection and testing of our water. 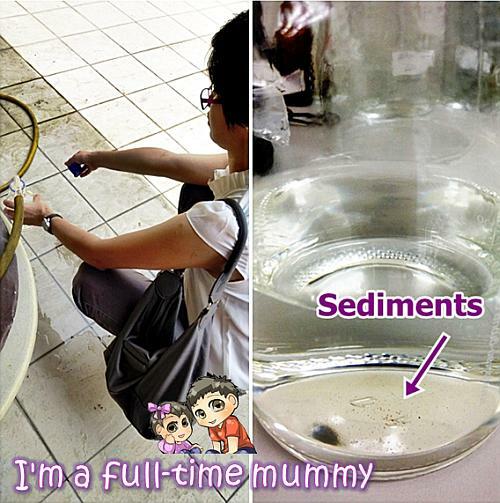 The staff took the water sample from our porch outside (after filtered by 'brand B' filter) and reverted with the results to us few days later and also sent us the photo shown above (right side) with the sediments settling at the base of the container which contains our water. We finally decided on a date for 3M to come over to our house with their technician to install their water filter system. I managed to take some quick shots of our 'brand B' outdoor water filter system in comparison with 3M's outdoor water filter system. Can you see the 'brand B' one was as high as myself? And see for yourself how small is 3M's water filter in contrast? We initially was surprised and wondered too whether such a small filter is able to do the job, but fret not, 3M has a technology where their filter particles are so extremely small and fine that it does a terrific job! 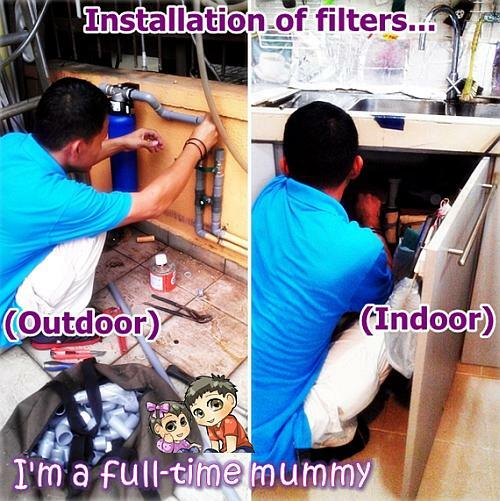 Anyway, the technician immediately went on to install the 3M water filter systems. While the technician drills and installs the 3M Drinking Water Filter System (Model: AP Easy Complete) which is located right underneath our kitchen sink (save space and looks neat outside), I let my kiddos play around with the filter cartridge. Again, a tiny little filter system, not heavy at all for my kiddos to carry! There's a sticker you can stick right on the cartridge to remind yourself when the time is up to change a new filter cartridge. 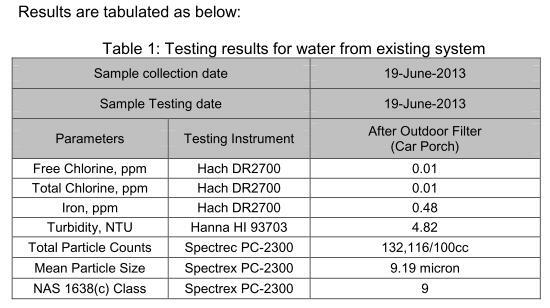 Here's how it looks like after the 3M Whole House Filtration SYstem (Model AP 902) was set up. A neat and small water filter system that does not take much space at all! The 3M Whole House Filtration SYstem (Model AP 902) helps to eliminate sediment and rush from the piping system. And here's how it looks like after the 3M Drinking Water Filter System (Model: AP Easy Complete) was set up. Just a tiny little faucet jutting out from our water sink, easy to lift black colored tab to turn on and off the water. The 3M Drinking Water Filter System (Model: AP Easy Complete) helps to remove 99.5% of filterable cyst, removing chlorine taste and odour, sediment and rust and also lead & parasitic protozoan cysts. You can read more on the NSF Certification for the AP Easy Complete here: PR3MNSFCert.pdf (682.84 kb). 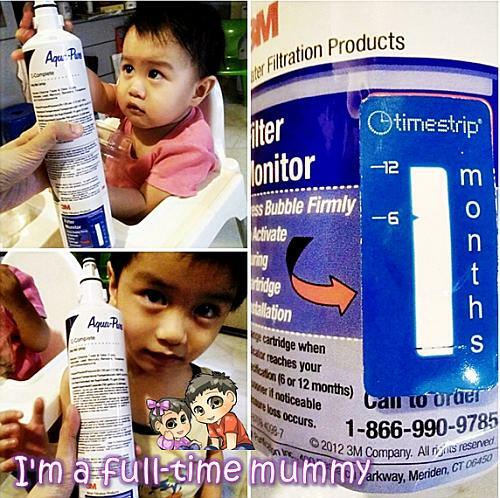 After installing 3M Water Filter Systems, we felt more at ease using our water. 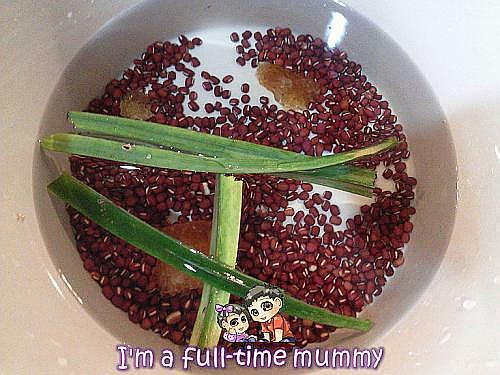 We washed our food and cutleries with the filtered water, we even use the water filtered for our drinking water (being Chinese, we are used to boiling our water so, we do boil our filtered water first) and I also use the filtered water to make my red bean drinks. We feel at ease as the filtered water can be drink directly from the tap and another good thing is last time when we use the 'brand B' water filter, it came with a carbon filter that filtered away the chlorine which actually helps to prevent and counter contamination. Imagine we have been using our water without chlorine for years! 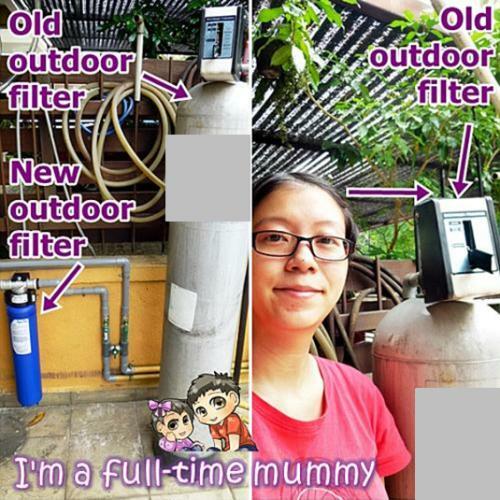 Just for your info, it is not good if an outdoor filter have carbon filter because the carbon's function is to reduce chlorine and the water kept inside the water tank needs chlorine to kill bacteria and slow down the bacteria's growth inside the tank. 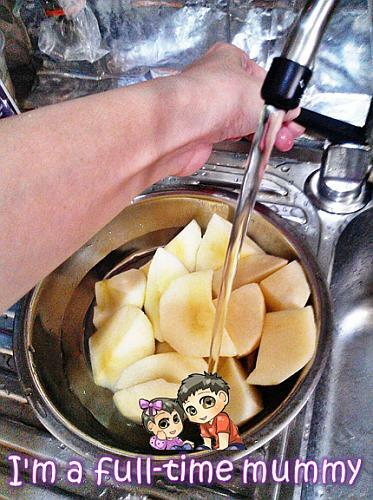 Maintenance wise, it is easy to change the filter cartridge for both indoor and outdoor water filter and there are also reminder systems to remind us when it is time to change the filter cartridges. Also with products produced by a well-known and trusted brand, it also adds up to our confidence level in continuing on to use the water filter systems! You can find out more info from 3M website. I received no monetary compensation for this review, I was provided with the product by 3M in order to facilitate my review. All opinions expressed in this post are my own. Please do your own research when purchasing products, as your opinions may differ from mine.